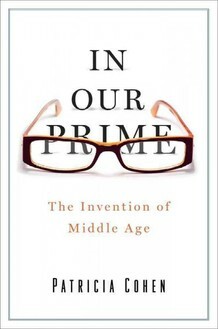 I finished reading Patricia Cohen's In Our Prime: The Invention of Middle Age a few weeks ago. 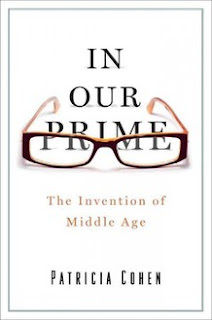 It's a terrific history of cultural forces that have (over the last 150 years) shaped our understanding of middle age, a seemingly 'natural' category that is anything but. Cohen's a veteran journalist; as a result, she knows how to sift through tons of data and shape it into a thoughtful, compelling story. Two of the book's notions are really staying with me. One, the persistence of the stereotype that middle age is the point at which youth unceremoniously ends and total lameness begins—when (balding, pot-bellied or big-assed) you realize—too late!—that your life hasn't amounted to much and that the future is just a miserable story of a slow decline into senility and irrelevance. The belief persists despite the fact that there's so much research indicating that this mythic slump has virtually no basis in fact. The other notion is Cohen's reworking of Eisenhower's "military industrial complex" idea into "the midlife industrial complex." Contemporary agents of consumer capitalism, in short, tell Boomers and Gen Xers that middle age is a time of growth/expansion and yet they must not seem or look middle aged and buying a vast assortment of age-defying products will assist them in their quest for a middle age that manages to look like youth. She points out that while middle age can be what we want it to be, resisting ads and images and zeitgeist forces telling us to buy, buy, buy our way back into youth is the true challenge.